One of its most important cultural events of the year in Tuscany is the exhibition featuring the works of Ambrogio Lorenzetti at Siena’s Santa Maria della Scala. Inaugurated by Italy’s President Sergio Mattarella, the show, which has been extended to April 8 provides a close-up look at the youngest of art history’s most famous brothers, sibling of Pietro Lorenzetti. The Santa Maria della Scala Museum has also teamed up with other cultural institutions and towns in the Sienese countryside to offer cultural events and openings of sites not generally open to the public, such as Palazzo Barabesi and Villa Brandi in Siena. 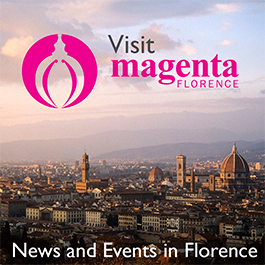 As well as major museums, sites linked to this initiative include the wonderful Pecci Medieval Gardens in Siena, Palazzo Corboli in Asciano, the Santa Fina spice museum and botanical gardens in San Gimignano, and the Pinacoteca Crociani in Montepulciano. Visitors can learn about daily life, costume, food and entertainment in the Middle Ages. The full itinerary and downloadable app, called “History through images: experiencing daily life and landscapes in Siena and its territory,” is available at https://musst.siena.it. Pietro and Ambrogio Lorenzetti, along with Duccio and Simone Martini, were the most eminent Sienese painters of the 14th century, and rank among the top 20 Italian artists of all time. However Ambrogio is still not as well recognized, as he deserves to be. Active from 1319 to his death in the great plague of 1347, this retrospective guides the visitor through his career. As one of the curators Max Siedel, says, “It is amazing that this outstanding painter has never before had a solo exhibition dedicated to his work.” Siena, which hosts roughly 70% of Ambrogio’s pieces, is the perfect venue to study the artist and bring him to life once again. For the first time ever, the Santa Maria della Scala show brings together his masterpieces from many locations in Italy as well as from Frankfurt, London, Paris and Yale. Ambrogio’s painting, even more than that of his older brother Pietro, embodies warmth of emotion, a sense of humor, and a freshness of vision never previously seen before in art. The humanity and the revolutionary insight in his vision makes his masterpieces speak straight to us across the centuries. Ambrogio’s Sienese panel of the Nursing Madonna is one of the most extraordinary depictions of maternity ever. Truly ahead of his time in his portrayal of the human psyche, and as the very first painter of naturalistic landscapes, Ambrogio anticipated the discoveries of Renaissance art by over a century. 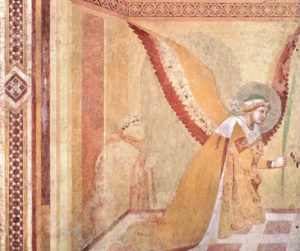 Ambrogio’s most famous achievement; the great fresco cycle, Allegory of Good and Bad Government, still decorates the walls of the Town Hall in Siena; a video at the show offers visitors a detailed view of the paintings. On loan from the Palazzo Pubblico is St. Michael the Archangel Conquers the Devil, a polychrome window created between 1325 and 1330. Ambrogio’s composition emphasizes the Archangel’s power against the snake. The piece is particularly striking, due to its bright colors of blue, red and gold in contrast with the white background and the use of darker colors in grisaille. Unlike his other works, which appear soft and delicate, this one is bold and solid. Around 1337, Ambrogio painted a similar theme in a triptych for the Rofeno Abbey in Asciano. The central panel, in tempera and gold leaf, depicts the Archangel Michael killing a many headed snake symbolizing the devil, placed below an image of the Madonna and Child and between side panels of St. Bartholomew and St. Benedict. The painting is distinctive due to the parallel alignment of the faces of St. Michael and the Madonna, which are looking in exactly the same direction and with very similar expressions. Their mirror image conveys the message that power and resilience can be found not only in men, but also in women. In two rooms visitors are able to follow the history of Ambrogio’s revolutionary frescoes, Scenes from the Life of Mary and San Galgano, seeing the works from close up. This is impossible in their original venue, the Hermitage of Montesiepi in San Galgano, in southern Tuscany near the town of Chiusdino. Located on a hill overlooking the picturesque ruins of the abbey, the Hermitage of Montesiepi was built to commemorate St. Galgano a year after his death in 1181. Painted by Ambrogio between 1334 and 1336, the frescoes were detached from the walls in 1966 due to their extremely deteriorated state. In preparation for the exhibition the paintings underwent two-year conservation in Siena, aided by modern diagnostic techniques and visible to the public. The original removal of the frescoes from the walls uncovered the plaster layer underneath, with Ambrogio’s preliminary drawings. These freeform sketches, known as sinopia, are often more spontaneous than the finished artwork. Never is this truer than in the frescoes by Ambrogio from San Galgano. In his Annunciation, the artist gives us a revolutionary, surprising portrayal of a traditional Christian subject. In strong quick brush strokes, reminiscent of Japanese ink painting, Ambrogio paints the young Mary shrinking in terror from the Angel Gabriel, falling to her knees and saving herself from collapsing completely by grabbing hold of the column to her left. The freshness of the image is striking and highly emotional. And probably too modern in spirit for the monks of San Galgano: only a few months after the work was finished, they called in another Sienese painter, Niccolò di Segna, to remodel the figure and face of the Virgin Mary to be more consistent with her traditional pose and composure. The ghostly image of Ambrogio’s original composition is visible underneath the later additions. Another “secret” revealed by the current restoration is in the Maestà (Madonna in Majesty) which was painted on the wall above the Annunciation scene. This iconic theme in Sienese art is given a completely new look by Ambrogio. In his composition the Madonna is enthroned with the figure of Eve lying at her feet. Eve holds a fig branch in her left hand representing the Temptation in Eden; her right hand holds a scroll whose inscription explains the moral of the scene. Eve’s drapery with its seductive folds, her carefully braided hair and her covering of a hairy goatskin complete with legs and hooves are in striking contrast with the regal figure of Mary above. The artist portrayed Mary not just as a vessel of reproduction, but a powerful character admired by all the surrounding saints who are offering her gifts. A figure symbolizing earthly Charity offers a large wicker-shopping basket, just one of the many highly unusual and amusing details of the painting.